After two years and nearly $2 billion in losses, Microsoft's Surface turned a profit in the September quarter, the company said Thursday. For the three months ending Sept. 30, Microsoft recorded $908 million in revenue for the Surface tablet line, an increase of 127% over the same quarter in 2013. The nearly one billion in revenue was a one-quarter record for the Surface, and beat the combined revenue of the previous two quarters. Using information in Microsoft's filing with the U.S. Securities and Exchange Commission (SEC), as well as data from earlier quarters, Computerworld calculated the quarter's cost of that revenue at $786 million, leaving a gross margin of $122 million. Cost of revenue is the cost to make and sell a product, but excludes expenses such as advertising and R&D. Microsoft said that the Surface line posted a positive gross margin -- implying that outside estimates of prior losses were correct -- but did not disclose a dollar figure. According to Computerworld's estimate, the margin was small, about 13.4%. That's more than the average for a Windows personal computer, but less than half or a third of the margins on tablets like Apple's iPad. It was even smaller by the figuring of Jan Dawson, principal analyst at Jackdaw Research, who has also used Microsoft's SEC filings to estimate the Surface's cost of revenue. He pegged the September quarter's cost of revenue at $825 million, the gross margin at $83 million, and the margin rate at just 9.1%. "That's a gross margin ... which is not earth-shattering and in fact about half the gross margin of the phone business at Microsoft. 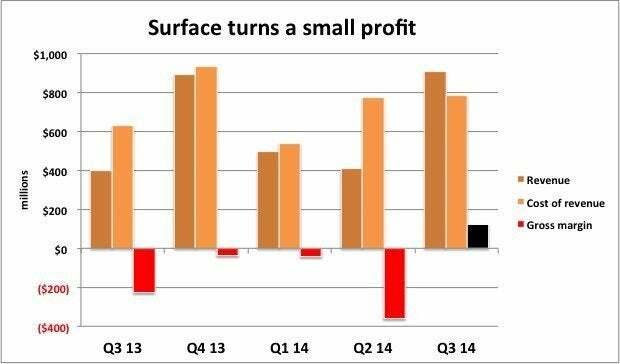 But it's progress," Dawson wrote on his blog, where he published his analysis of Surface's financial performance. Since its October 2012 introduction, Surface has been a money pit for Microsoft, in the hole to the tune of $1.73 billion through its first seven quarters. With the September quarter in the black, those overall losses have been reduced to about $1.6 billion. 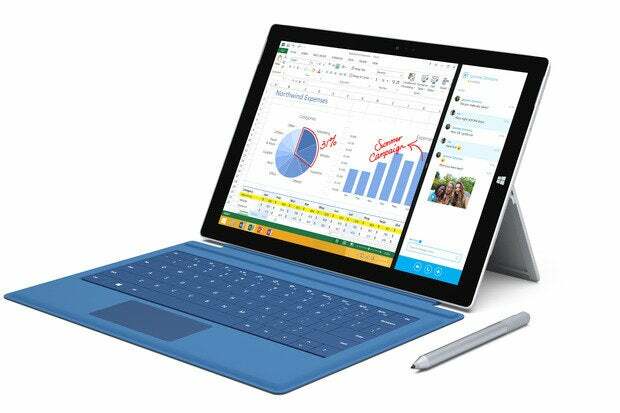 Over the last four quarters, Surface also remained in the red, with losses of $325 million on revenue of $2.7 billion. Put another way, for each dollar Microsoft earned on Surface sales, it lost about 12 cents. But were the brighter figures for the September quarter an accurate picture of what Microsoft really spent on the Surface? No, said Dawson and others. "There's a long way to go to get to the kind of gross margins that would lead to true profitability once marketing and other costs are factored in," Dawson said. Ben Thompson, the independent analyst behind Stratechery.com, agreed in his subscription-only Daily Update of Friday. "What is all but certain, though, is that this segment, once you include advertising and channel, was still quite unprofitable, and likely unprofitable by a lot," Thompson wrote of Microsoft's Computing and Gaming Hardware division, which generates the bulk of it revenue from Surface and Xbox sales. Microsoft's advertising campaign for the Surface has been substantial, with widespread television spots, and its marketing spending has also been brisk, including a reported $400 million deal with the National Football League (NFL) that put Surface tablets on the sidelines. Microsoft called out the Surface Pro 3, which went on sale in June -- making the September quarter the first complete quarter that booked Surface Pro 3 revenue -- in its earnings call with Wall Street for sparking the surge. "Unit sales are pacing at twice the rate of what we saw with [Surface] Pro 2," said CFO Amy Hood, referring to the now-discontinued model launched in the fall of 2013. "The release of Surface Pro 3 in June 2014 contributed to a 126% increase [in revenue], reflecting higher premium mix of devices sold," Microsoft said in the 10-Q filed with the SEC. Thompson seized on the latter's "higher premium mix" to make the case for why Surface revenue jumped. He pointed out that the high prices of the Surface Pro 3 -- between $799 and $1,949 -- generated the increase, while the revenue in the comparative quarter of 2013 was fueled by large numbers of Surface RT tablets that Microsoft sold at fire sale prices to unload an overstock. Last year, Microsoft cut the price of the Surface RT to $349 for consumers and to as low as $199 for educational institutions, representing 30% and 60% discounts, respectively, from the original list price of $499. Both Thompson and Dawson noted that Microsoft did not reveal Surface unit sales, making it impossible to determine which models have sold best or tell if volume was up, flat or down. "We don't know the number of units sold or average selling price for the Surface, but considering that the Surface Pro 3 starts at more than double the price of last [year's third quarter] Surface RT, it's likely that Microsoft actually sold fewer Surfaces this quarter than they did a year ago," said Thompson. "How many Surface devices did Microsoft sell in the quarter? Well, they won't say, but given the new version starts at $800, it's entirely possible that the company sold a million or fewer Surface tablets in total, and likely well under a million Surface Pro 3s in their first full quarter on sale," added Dawson. As a comparison -- although Microsoft denies that the Surface Pro 3 is a tablet, preferring to dub it a notebook replacement instead -- Apple sold 12.3 million iPads in the same quarter, producing $5.3 billion in revenue. Microsoft must do better if Surface is to be a viable business rather than a vanity project. "The gross margin has to keep moving up at this point," Dawson said in an email reply to questions. "It's at a point in its history when it has to get beyond the early losses to a sustainable business." Microsoft posted its first positive gross margin for Surface line since it started selling tablets two years ago.